Inking notes within Windows 10 has never been easier. Use your Surface tablet as a tablet! Inking and navigating with a digital pen or stylus within Windows 10 has become easier within the Fall Creators Update for those of you who use a tablet as, you know, a tablet. The improvements include two major elements: navigation, including using the pen or stylus to select and scroll text; and better interpretation of inked words as text, via a more accurate and responsive handwriting panel. Combined, it’s a love letter of sorts to Surface and other tablet users who use the pen to input data. It's amazing how well Windows can interpret your chicken-scratch into text that can be edited in Word and elsewhere. General Windows 10 users won’t be able to take advantage of the new features until the launch of the Fall Creators Update on Oct. 17. (Many of you will still have the older Windows 10 Creators Update for some time unless you manually update.) However, members of Microsoft’s Windows Insiders beta program have been able to experience the new inking experience since Build 16215 in June. Now, you can, too. To take advantage of the new inking capabilities, you’ll obviously need a tablet and a stylus, too. If you need to find it, we’ll wait. What, you’ve lost it? Well, Windows can help. 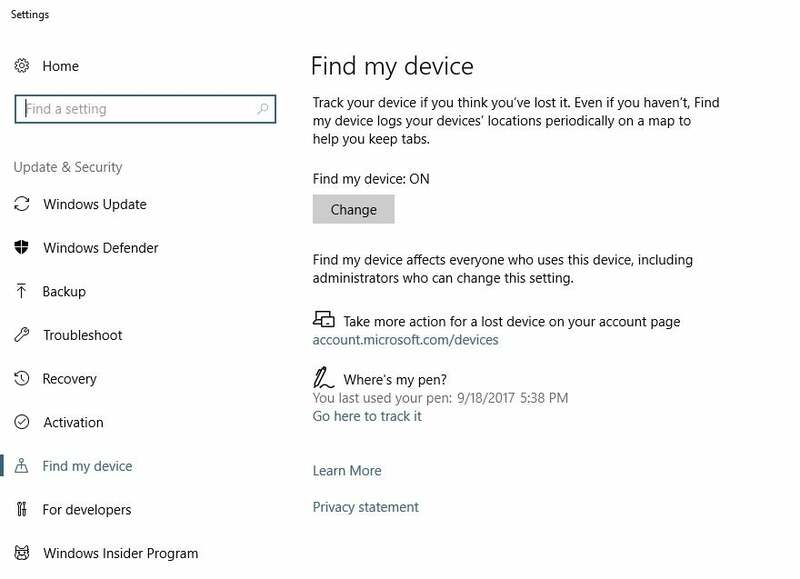 One of the new features of the Windows 10 Fall Creators Update is “Where's My Pen,” a feature that will help track down a lost pen—sort of. It operates in the same way Microsoft or Google help to track down a lost phone, by identifying the place where it was used last. 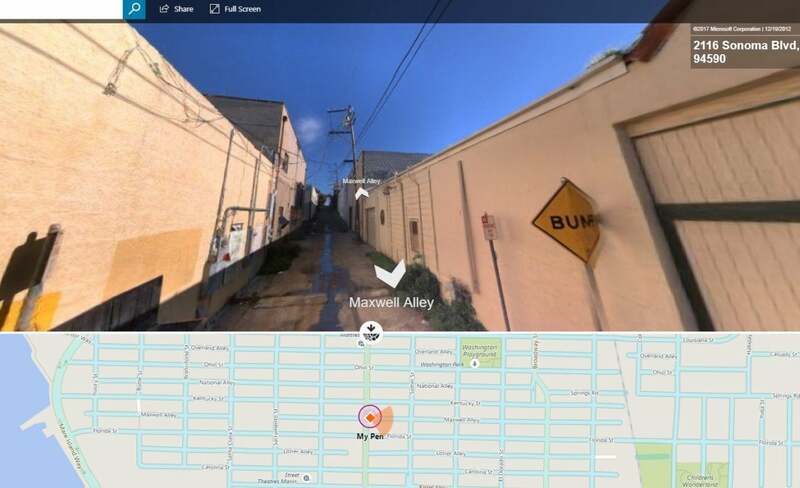 Make sure you’ve turned on location services on your tablet, so Windows can find the location on a map. Note that Windows won’t find the pen itself; it will simply record the time and location in which it was last used, as well as the location of the tablet that it tapped. Unfortunately, Windows can't intelligently sense the presence of the pen itself; if it's fallen behind your desk, Windows won't be able to help. And, unlike with a phone, Windows can’t command the pen to beep to help you find it. ...which thought the pen was in a nearby town, when it was actually in my hand. Make sure that the pen is paired, as Windows won’t record the location of the pen unless it’s paired properly. Unfortunately, after all that, Windows failed miserably in actually geo-locating my pen. As the image above illustrates, Microsoft thought it had fallen from my backpack in an alley next to a tattoo parlor in a different city altogether. Sorry, Windows, I was actually holding it. Why is this important? Because while you can draw a swirl or a squiggle within Word or Paint, the handwriting panel doesn’t work with your finger. You’ll need a digital pen for that. By now, you probably have a preferred way of navigating around the screen: mouse, certainly, or maybe touch. Windows now has another: You can move around a Web page by “drawing” on the screen, using your pen tip to drag the contents of a window around. Highlighting text is straightforward enough. But you’ll need to highlight, click the pen button, then touch the screen to copy it. It’s a bit awkward, if only because you’ll sometimes need to feel your way through which actions are interpreted as ink, and which are interpreted as navigation. Take a webpage, for example. 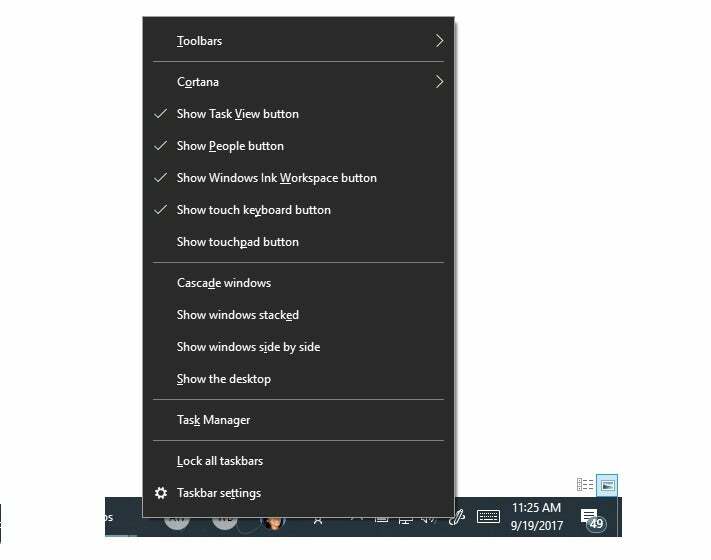 Within the Fall Creators Update, you can slide webpages up and down by running a finger over any part of a page. Performing the same gesture with a pen, though, selects the data. To navigate with a pen, you’ll need to trace the scroll bar. Given the option, a mouse and thumbwheel is still my preferred option. But with a tablet or touchscreen, pen navigation does the job once you learn its quirks. Once it comes to writing actual words with your digital pen, though, Microsoft's new handwriting panel does an impressive job of interpreting inked words as editable text. Enabling what Microsoft calls the Handwriting Panel can be accomplished in one of two ways: tapping the pen on a text field, or clicking the keyboard-shaped icon on the taskbar. Note that the keyboard icon won’t appear on your taskbar unless you right-click the taskbar and select Show touch keyboard button from the menu that appears. 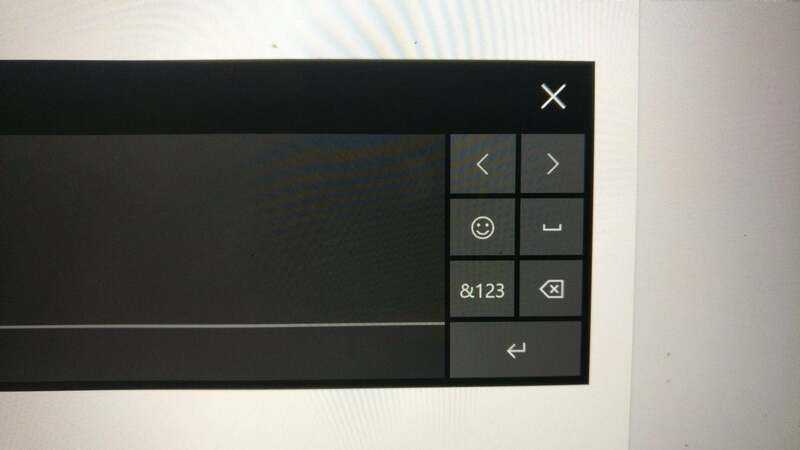 Make sure you enable the keyboard, or you may have to undock your tablet to force Windows to display it. Once you’ve enabled, and clicked, the touch keyboard button, you’ll need to enable the pen input by selecting the pen keyboard. Otherwise, the "soft" keyboard will remain, allowing you to tap characters. 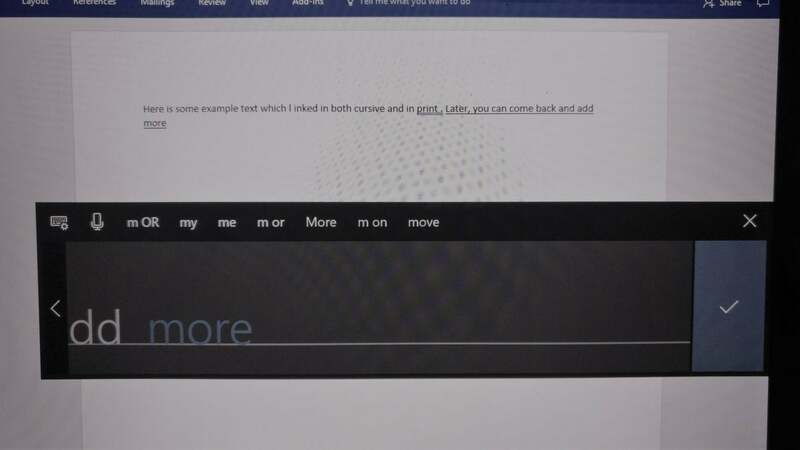 Within the Fall Creators Update, the handwriting panel should “float’ up to where you need it, rather than remaining at the bottom of the screen. You can drag it around to where it’s most convenient. The handwriting panel allow you to ink, either in manuscript or cursive, and in multiple languages. 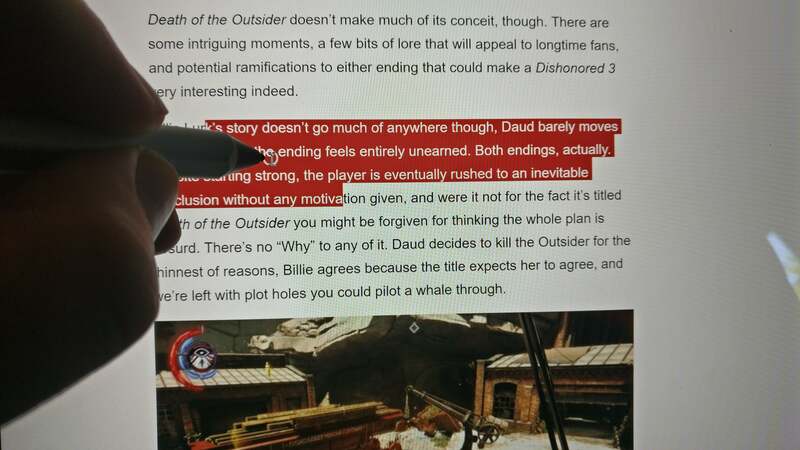 Once your ink is interpreted, a word appears, and the text moves over to allow you to continue to write. If you make a mistake, you can line out the word to correct it. The new handwriting panel makes intelligent inking a snap. Thanks to years of quickly jotting notes into a reporter’s notebook, my penmanship has slowly degraded into some sort of nightmarish fusion of English and alien hieroglyphics. But Windows accurately recognized my handwriting, intelligently providing predictive text at the top of the window that I could tap if I didn’t want to complete my word. It handles cursive, too—or even a mix of both. Some of my worst scrawls were accurately interpreted, leading me to believe that Windows’ handwriting engine does even better at interpreting inked cursive than raw printing. Obviously, every feature in the world doesn’t matter if Windows can’t do the basic task of interpreting your handwriting—and on this, I think Windows does a very good to even excellent job. 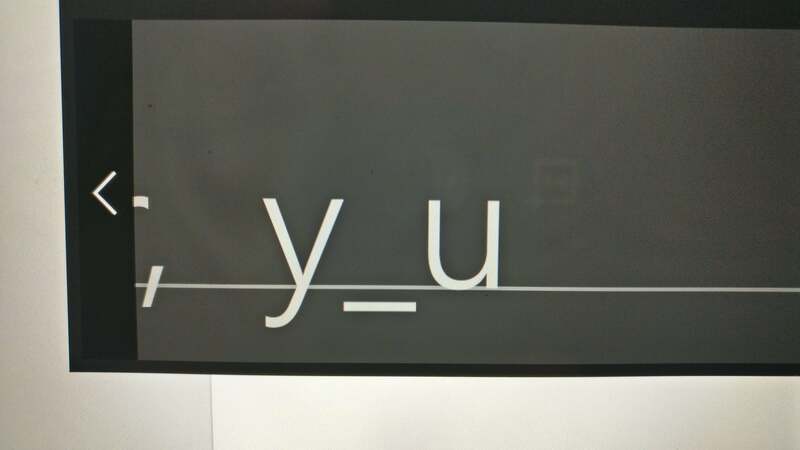 Lining out a letter leaves a space, which you can fill in. As the handwriting panel fills up, the text intelligently moves to one side, allowing you to keep on inking. (Not perfectly, though; I felt like my writing space was constantly moving.) That inked text, naturally, is added to wherever the cursor is: a text field, Word, a URL, et cetera. A small series of buttons to the right of the text field also allows basic navigation: moving forward and back in the sentence, adding a space or an emoticon, and more. If you do make a mistake, you can line out or strike through a word, deleting it. You can also join words together by drawing a small connecting arc between them. If you accidentally place two words close enough together that Windows thinks they’re a single word, drawing a vertical line between the two letters will separate them. A small navigation panel to the right of the text box allows you to tap through words, rather than use your pen. There’s even emoji. Inking within the Windows 10 Fall Creators Update isn’t perfect. 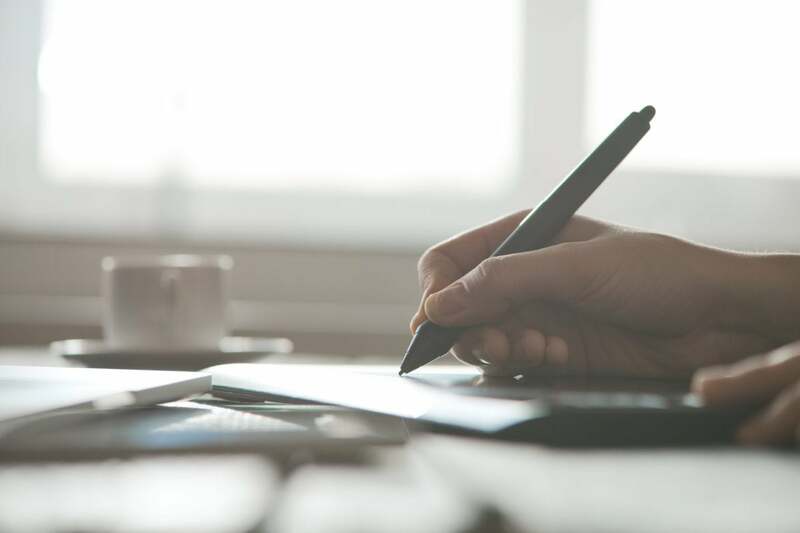 For one thing, it’s nearly impossible for Windows to tell whether your scribbled note on a Word document is supposed to be just an inked illustration, or an interpreted word. The way around this is to have the handwriting panel open somewhere on your screen. That way, you can jot whatever notes you like, as images. When you’d like to write notes that you want translated into text, you can use the panel. Keep in mind that the handwriting panel, like the new dictation features within the Windows 10 Fall Creators Update, is really aimed at a specific niche: not just users who own a tablet, but who often undock that tablet and ink, too. But what’s really behind this is flexibility: nothing’s forcing you to use the pen. But if you do, Microsoft wants your experience to be as productive as it can possibly be. This story was updated on Oct. 23 after the launch of the Windows 10 Fall Creators Update with updated information.